The Imagine 2.0 Newborn Bamboo Fitted Cloth Diaper is made from incredibly absorbent, yet unbelievably soft bamboo that you will feel good putting next to your newborn's delicate skin. The bamboo soaker pad is sewn in the back of the diaper and snaps down in the front with hidden snaps to make for easy changes and quick dry time. Gathered leg casings hug your baby perfectly while preventing leaks. The Imagine 2.0 Newborn Bamboo Fitted Cloth Diaper is available in 5 beautiful shades of bamboo and comes in either snap or hook & loop closure. The snap closure features a snap down umbilical cord dip to allow for your little one's umbilical cord to heal. It is made with high quality and durable snaps. The hook & loop closure features a high quality hook & loop that will last through many washings and generous laundry tabs for easy laundering. We've used an incredibly soft, yet ultra absorbent 100% bamboo viscose material to construct the Imagine Newborn Bamboo Fitted Cloth Diaper! The body of the diaper is 3 layers of this material and the soaker pad is a thirsty 5 layers. A diaper cover is needed to make the diaper waterproof. This special newborn sizing is designed to fit your littlest one without unnecessary bulk. To prep your Imagine 2.0 Newborn Bamboo Fitted Cloth Diaper for its first use, you will need to wash and dry it at least 3 times, using detergent with each wash. 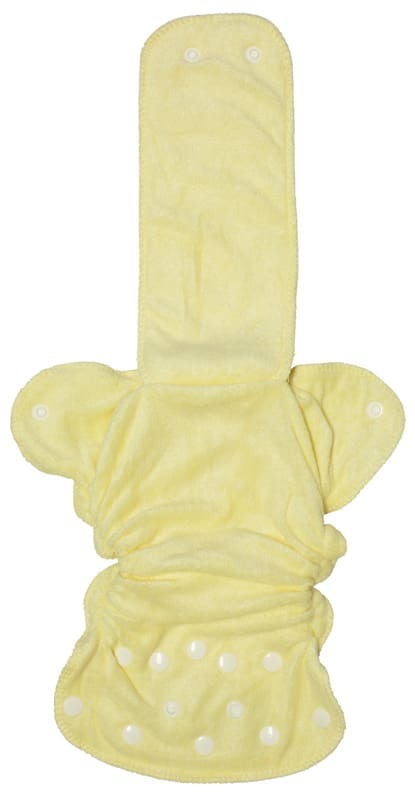 The Imagine Newborn Bamboo Fitted Cloth Diaper fits approximately 5-13 pounds.